Do women travel in a way different from men? Yes! This is about the many women travellers and explorers who travelled the world at different times and for many different reasons. Not excessively concerned about reaching their destination, women tend to wander, to deviate from the well-trodden paths. They focus, not on the horizon, but on what is going on around them. They are good letter writers and keepers of diaries which is a boon to the researcher. The earliest traveller in this book is Egeria, who went to Jerusalem in 383 CE and was an enthusiastic letter writer. 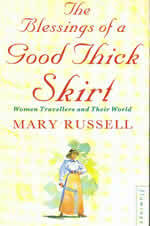 The Blessings of a Good Thick Skirt is about the many women travellers and explorers who travelled the earth for a variety of reasons: to lead a more exciting and challenging life, to make a religious pilgrimage, to escape marriage, to accompany their husbands or, as in the case of Mary Kingsley, to satisfy a pure and unashamed curiosity. The title comes from a remark she made about the new, modern sort of clothes – bloomers, divided skirts etc – that the New Woman was starting to wear and which she resolutely refused to wear. She was a woman apart but so too were Alexandra David- Neel, James Barry and, my own favourite, Margery Kempe. The Blessings of a Good Thick Skirt is the result.